A year ago I wrote a blog about Zeroing Out before using your camera each day or shoot. I have been doing much better since I published the post. Lately, I have been trying to get better photos by using custom white balance. Thus, I have run into a new issue to remember as you can tell by the two photos below. While the custom white balance worked well in the dining room which had incandescent lighting. When I took the photo on the left, I got this blue shifted photo. This table was near the entrance with light from the hallway spilling in which used tungsten lighting. I happened to think I better check the LCD at the time and switched to auto white balance. It’s not perfect either but much closer to the real colors. I can further adjust the photo in post-processing and it will take much less time, too. I will continue to work with white balance adjustments as I find my photography is much improved when I use it correctly. Accordingly, I will be much more aware of changing light as I do so. Another great tool to use for setting custom white balance is an Expodisc. This entry was posted in Photography and tagged auto, custom, expodisc, incandescent, tungsten, white balance. Bookmark the permalink. The Auto WB setting definitely got better results! It looks a little under exposed, too, and the whites should look much whiter just by brightening the photo. I always forget to change my WB setting, and usually have it on Auto. I’ve never attempted custom WB. I use Auto WB most of the time, too. When I see a predominate color cast, that is when I am trying the custom white balance route. I just need to be more aware of when the light changes to either take a new white balance or fall back to AWB as I did above. These photos are SOOC and will not be used except here. Just a example of what happens when you start working beyond the automatic white balance setting. Do you normally shoot RAW or JPEG? 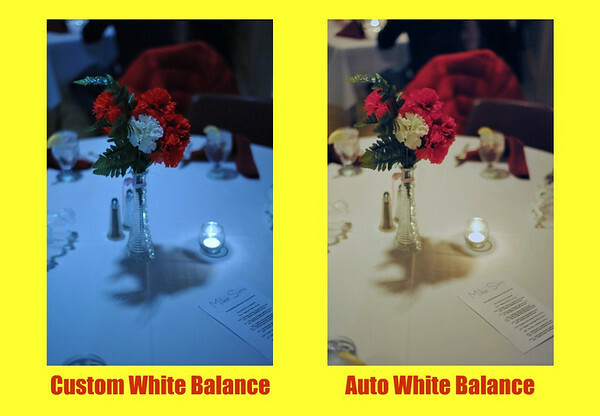 If you’re shooting RAW you should be able to get away with using auto white balance all the time. I’ve been playing around with the idea of trying to see a custom white balance when I photograph hockey matches. I shoot JPEG with auto WB and it works 90% of the matches. However in every game there will be a small percentage of shots that are ruined because they catch a tint from the sections of ice with color behind it. Tends to happen when it’s the same color on top of one another, players with red uniforms skating over a patch of ice with red under it. I shoot mostly JPEG for many reasons I may go into on another day. However, it is surprising how much white balance latitude there is in JPEG files using today’s tools like Aperture and Lightroom. I shoot a lot of hockey and take a custom white balance before each game right off the ice after pre-game skate and BEFORE the ice is cleaned. You want the “dirty” ice. The big problem I have around my area it the kind of lighting which cycles causing red, blue and green color casts periodically. People don’t see the casts as their brains filter it out but the camera sees all! Huh, I rarely shoot in Auto WB. I find it makes things too ‘cold’ and I tend to like warmer shots. My fav WB is Daylight. I also find in situations like the above, with so much white in the image, using Spot metering can brighten the whites. Interesting. Did you know you can make AWB warmer and cooler? The front dial can set any white balance warmer (+1, +2 or +3) or cooler (-1, -2 or -3). On the D70, I set it to AWB and +3. Would give me very rich and warm colors. I’ve been playing with WB a lot lately too. It has been a challenge this winter. I’ve never tried custom WB as it seemed like a lot of work! I’ve found my “cloudy” WB, or even “shade” setting does give a nice warmth to pictures at this time of year. I use Auto when I just can’t figure out what to use. Did you find out if you could adjust Canon’s AWB? I know there are some that say set it to cloudy WB and be done with it. For me and the way I set up my camera, that creates very red/yellow color casts. Still learning how to get the best photos out of the D700. It’s a fun task if not a little aggravating at times. Scott, I’m glad that I’m not the only one struggling with this. What I do now is to do a test shot for my WB first when I’m shooting indoor, and strangely I discovered that cloudy WB comes out better than shade WB for indoor. Nye, it is a quest for me as I learn new ways to create photos under different conditions. I did take a test shot where the custom WB worked great. Just need to be more aware of when the light changes and how. Those little details which need to be taken into account.